Earlier this summer Keystone hosted the Rocky Mountain Endurance Series Snake River Mountain Challenge (pictured). Sunday, series organizers will put on Keystone's first Cirque de Wheels, a circus-themed bike festival with a beginnerfriendly bike race. For most people, 2,500 vertical feet of uphill biking would seem more like punishment than fun, especially with a perfectly good gondola covering the same ground. But for some, that’s not enough: Multiply that elevation gain by three on a 54-mile, three-lap, course and you have the marathon racecourse for the Snake River Mountain Challenge at Keystone Resort. The Mountain Challenge, part of the aptly named Rocky Mountain Endurance Series of races, also had a shorter, albeit still punishing, two-lap, 36-mile, half marathon race and a one-lap 18-mile “cross country” option for those slightly less masochistic. “It’s good now that I’m off,” said Doug Radi, 46, of Golden, shortly after finishing the cross-country course. He was one of more than 200 competitors who took part in the races Saturday. Racers described the course, which incorporated parts of the Keystone Bike Park terrain, as pretty technical, with a brutal climb and a rocky, fast descent. “It’s a pretty legitimate mountain biking course,” said Scott Archer, who won the cross-country race. The 25-year-old Breckenridge resident contemplated one of the longer races but opted for the shorter one since he is training for other summer events. Racers started at staggered times for each race class. After a short section through Keystone’s River Run Village at the base of the mountain, they made their way up a combination of service roads and singletrack. “The first half mile is just a wall,” Archer said of a steep section of service road that kicked off the ascent. The course then took competitors up “Let It Ride” trail, then down an approximately 500-foot descent, making the total ascent more like 3,000 feet, before reaching the top of the gondola. From the gondola, the course continued even farther along the summit ridge on Dercum hiking trail, which is usually closed to bikers, before barreling 2,500 feet back down back to the village. During the grueling ride, competitors were treated to a number of sprawling alpine vistas. Most racers, however, likely didn’t take the time to look much higher than their handlebars to enjoy them. This was the first summer the Snake River Challenge was run, after an almost 10-year hiatus. It’s part of Keystone’s effort to bring more competitions to its renowned downhill mountain bike park. Next week the resort will host a two-day multi-stage race as a part of the Big Mountain Enduro Series. That event, while open to amateurs, is geared more toward pros. But there will again be a variety of entertainment opportunities for spectators. The Snake River Festival continues today with events geared toward the recreational rider. “Saturday is the competitive day, Sunday is the recreational day,” said Rocky Mountain Endurance series organizer Thane Wright. Today’s events include a number of free programs, including a progressive bike-skills clinic starting at 9 a.m. and recreational guided group rides from 11:30 a.m. to 1:30 p.m., followed by live music at River Run Village and a children’s balance bike race. 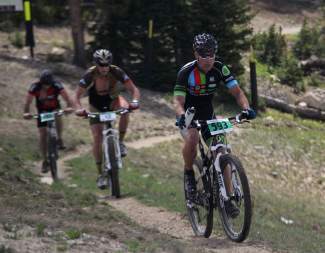 The final event in the Rocky Mountain Endurance Series is the Breckenridge 100, on July 14. There will be 100-, 68- and 32-mile races, with series champions to be crowned.